Blogging about my love of playing old school Dungeons & Dragons! 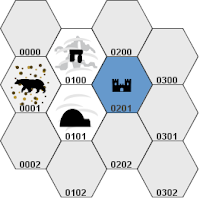 "It takes just three hexes to start a campaign." Anyway, the idea that prep and content don't have to be ginormous is something that I've preached since Day 1. I mean, I didn't do so much to really start with my ongoing nine year AD&D campaign. I had a little story I'd written and a concept of what I wanted the world to be. Say, three sentences. My world is a post-apocalypse world where civilization is retreating from the forces of Chaos. Magic is hated, there is only one official religion and the rulers are afraid of the future. There is much out there to be recovered if someone is brave enough. Then, in the style of West Marches campaign, I created a homebase - let's call that hex Zero. 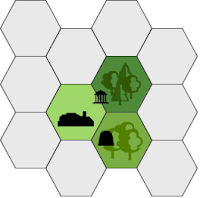 A town is easy to create and is almost a given for starting - which is why I don't include it in the three hexes. Anyway, let's call that town "Enonia." What's a good story for Enonia? Hmm... no more than three sentences. This is what I came up with. Enonia is a town on its last legs, on the edge of retreating civilization. It used to be a crossroads type of town, on the road to the great lost city of Irecia to the east. The unsure Marshal lives in the Keep close to town. That's some good flavoring to set me off on figuring out what is going on within the town and around town. So now I need destinations for the players to go do things. This is where I looked around at what I might have, either as existing dungeons or things I've created, or something that appeals to me. At the time I started my Etinerra (formerly Dark Ages) campaign, the magazine Fight On #1 had just started publishing in Spring 2008 and was/is a great resource. Within issue #1, I found a small adventured called The Ruined Monastery by James Maliszewski. It's a great start for a little introductory adventure so I put it to the right of Enonia. The Dark Woods are where the Goblins and Spiders live. Between Enonia and the Woods lies a ruined monastery, abandoned before the Doom. It is whispered that Chaos might have found a home here. The Dale Woods are home to the crafty kobolds. Brave hunters who dare enter the woods have found entrances to what seems to be a cave system, but none dare go within. Between the Dale Woods and Dark Woods lies the abandoned road to Irecia - with a bridge that crosses over a stream. Since I had this idea of a lost city to the east, I also wanted to give the players some reason to go out that way... and I came up with an idea of a ruined inn at the edge of the woods, before the grasslands. So here was my third hex. At the ends of the woods lies the remains of a Wayfarer's Inn lies. Beyond the inn is the road to the grasslands surrounding the lost city of Irecia. Nobody have been to either the ruins of the Inn, or to Irecia, in two generations; rumors abound to what may lie forgotten. That's it! That's all I needed to start my campaign world off. 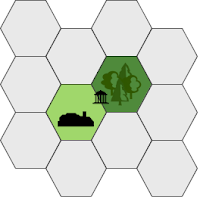 A town/homebase and three hexes. This is a post-apocalypse world where civilization is retreating from the forces of Chaos. Magic is hated, there is only one official religion and the rulers are afraid of the future. There is much out there to be recovered if someone is brave enough. Homebase (0101): Enonia is a town on its last legs, on the edge of retreating civilization. It used to be a crossroads type of town, on the road to the great lost city of Irecia to the east. The unsure Marshal lives in the Keep close to town. 0201: The Dark Woods are where the Goblins and Spiders live. Between Enonia and the Woods lies a ruined monastery, abandoned before the Doom. It is whispered that Chaos might have found a home here. 0202: The Dale Woods are home to the crafty kobolds. Brave hunters who dare enter the woods have found entrances to what seems to be a cave system, but none dare go within. Between the Dale Woods and Dark Woods lies the abandoned road to Irecia - with a bridge that crosses over a stream. 0301: At the ends of the woods lies the remains of a Wayfarer's Inn lies. Beyond the inn is the road to the grasslands surrounding the lost city of Irecia. Nobody have been to either the ruins of the Inn, or to Irecia, in two generations; rumors abound to what may lie forgotten. That's it! That's all I needed to get things started - grab a map or two for the monastery, the dwarven mines and the abandoned Inn and away we go. Let's try another. This will be something that I have not thought about or played within my campaigns, a fresh start from scratch. Campaign: All lies frozen under snow and ice, as The Land heals from its wounds from the Great Wizard Wars.. The once-proud civilized races struggle for survival against the snow, the ice, the wind and the arcane storms that howl outside. The gods cry out for those brave (or foolish) enough to dare start The Healing. Homebase (0101): For many generations, humans and dwarfs have lived in the ice and snows of Elketra. They survive in a constantly changing landscape within their igloos and tents. The great wandering caravans of mammoths make their way here twice a year, bearing goods, news and visitors to this place. 0001: Legend says that the Great White Bear lives in the cold sands to the northwest. It is a trial of adulthood for both men and women to journey to seek The Bear, for it can foretell one's future of glory or misery. There are many horrible creatures and dangers in the journey that few make. 0100: Great, silent menhirs surround the barrows and tomb-tunnels of old, dug within the glacier that spills into the sea. Treasures beyond imagination are said to lie within, as well as a great artifact lost by the Ura-Wizard Mekelteth, who fell in the Wars. The angry spirits that roam the ice fields do not tolerate intruders into their domain. 0201: Legend says that on one the great bergs that float on the seas is the castle of the last Wizard Assassin. Her remains are whispered to lie within the castle, guarded by sea monsters, terrible wolves and spirits of those she killed. She was the last to hold the Great Staff of Law - an artifact which could bring life back if wielded by one with a true heart. Purely off the cuff, made only by imagination, some use of various things I've seen in my own readings, gaming and culture. Time it took to write all that? Thirty minutes. Yet, I have at least 3 different places for the players to go, plus some interesting tidbits of other things that I could use if I were to run this as a campaign. You can do this too! Three hexes is not that hard to come up with, and you've given your players a limited set of choices to start with - as versus some huge world where choice-paralysis might set in. Three Hexes by Michael "Chgowiz" Shorten (chgowiz@gmail.com) is licensed under a Creative Commons Attribution 4.0 International License. Thanks for given an example of this. It's actually pretty simple but it's so simple it's easy to overthink or overlook. I have a tendency to overthink things when I want to set up a campaign, usually to my detriment. Giving. Thanks for giving an example. What software are you using for these maps? This is really brilliant in its simplicity! 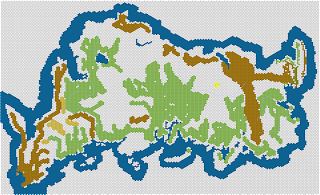 I've done a few dungeon crawls, and I'd like to try out some simple overworld adventuring as well. This seems like a handy tool, coupled with the one page dungeons, to get started with some beer-and-pretzel hexcrawling. Love it! Whats the scale of these hexes? Is it just 1 a mile, or does it take a days travel to move from one to another (about 30 miles)? Hi Benjamin. For me, it's roughly 24 miles, or the distance a person can walk in 1 day. That's useful for wargames as well as D&D purposes. However - you can make them whatever fits your campaign and style. I've left it generic enough (unless it's the outer space maps) that you can make it your own. Home of Three Hexes Campaign Starters! "Three Hexes" are simple campaign starters to show that show you don't need to do a lot to have interesting settings for people to play in. Check them out! Proud to be a member of the Demo Team for Chaos Wars! Ultima RPG on Roll 20 - Looking for Players!